Michelle wished for a flat screen TV and DVD Player. We granted her wish along with an iPad, DVD's, Printer and gift cards to her favorite store so she could take her time and shop online. We were able to surprise her with her family and friends present. Amanda wished for a MacBook Pro and a Canon SLR Camera to pursue her interests in photography. We granted her wish along with all the accessories and more. Wendy's wish came true with a new laptop and cameras along with all the accessories and more. We surprised Wendy in the clinic to make her day more fun than she could have wished for. Wendy's wish was sponsored by Laurie Hansen, Denise Jones, Gus Giana, Earl & Lori Greer, Teri Huffman, Kathi Conti, Karen Carlson, Chris & Erica Olsen, Cristina Meyer, June Wilson, Mary Wixted, Kent Koepsell, Davis Ammari & family, Linda Steer, Pat & Hunt Piper, Liz & Ryan Hawkins, Emily & Family, Megan El-Hinn. Alyson wish came true with a MacBook Pro and Final Cut Pro to help her keep up with her classmates on special projects and more. We surprised her at BJ's Restaurant in Escondido with her Parents. This wish was sponsored by Laurie Hansen, Bonnie Cummins, Earl & Lori Greer, Kathi Conti, Jeff & Karen Carlson, Teri Huffman, Gus & Cindi Bruner, Chris & Erica Olsen, Marsha Zoller, Mary & Dan Wixted, Kent Koepell, Pat & Hunt Piper, Linda Steer, Emily & Family, Jill & Dave Kistner, Davis Ammari & Family, Lennie & Christine Mayfield, and June Wilson. 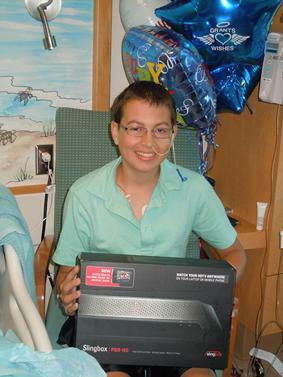 Colin's wish was granted with a Alienware Laptop for gaming. We surprised him with a gaming mouse and backpack just for Colin. Microsoft Office Student Edition was also loaded onto his computer for school work. We surprised him at BJ's Restaurant in San Bernardino with all his family present to help make his wish extra special. Lastly we surprised him with Universal Studios Season Pass for Colin and a family member that can take him to Universal Studios for the next year. 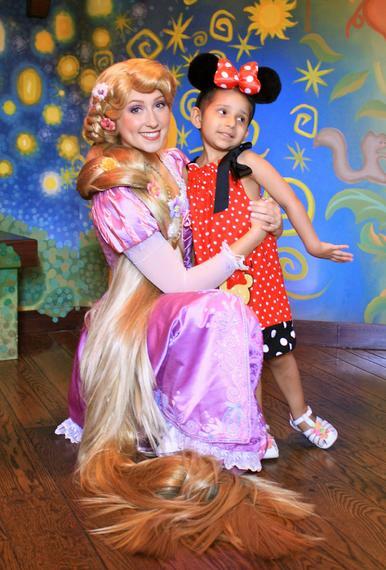 Sarah's wish was granted with a trip to Disneyland. Beginning with a 2 night stay at Disney's Grand Californian Hotel. Sarah's grandma had surprised her with Disney Season Passes so we were able to surprise her with princess dresses, clothes and PJ's. We also arranged for Sarah to have an appointment at the Bibbity Bobbity Boutique for the princess treatment. Sarah said "she wished upon a star and all her wishes have come true". 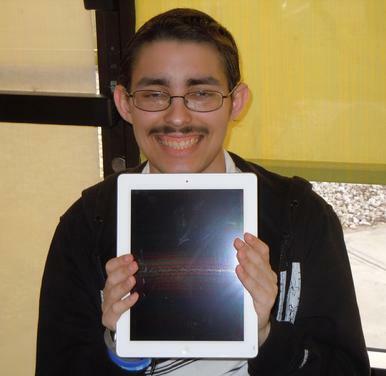 Zachary wished for a MacBook Pro laptop, Dr. Dre beats tour earphones and slingbox pro-HD. He wanted the laptop for school work and the slingbox pro allows him to access his home DVR and Channels on his laptop. 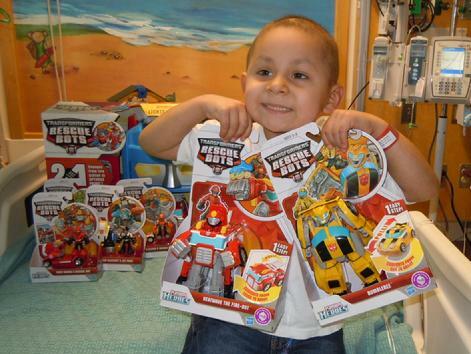 We granted his wish inpatient so he would have his wish gifts while undergoing his treatment. We surprised him with lunch from Red Robin his favorite restaurant, picking up his favorite Clucks and Fries and to top it off we picked up 2 cupcakes to help him celebrate his birthday. His mom and grandma were present and the rest of his family via FaceTime. Zachary loved his wish surprises. Angel wished for a DS Super Mario, a Laptop, and shark toys. We granted his wish with a Nintendo 3DS and lots of games too. We also surprised him with a new laptop, nerf toys and target, shark toys and an iPad so he could play games. Emily wished for a Zen bedroom makeover to relax and a meditation like atmosphere. We granted her wish with the help of her mother. Emily went shopping with her sister and helped her with her kids so we could redecorate her room. Emily came home to her new zen room and was thrilled with her new room. They had her bed and headboard but we surprised her with a 6 drawer dresser, 2 night stands, 2 stone lamps, recliner chairs with foot stool, floor lamp, side table along with pictures for the walls and water feature and accessories for the dresser. Beatriz wished for an Apple computer and a printer. We granted her wish at 9:00 am in the morning, we were her wake up call but she was happy. We also surprised her with a new iPod Touch and iTunes Gift Card along with a MacBook laptop, case, printer, ink and paper. Nicolle wished for a Dell Switch Laptop and blue cover, camera and a Kindle Fire. We granted her wish at her home with all her family present. The big surprise was her new full size bed complete with all the bedding, comforter, blanket, mattress pad and pillows. We also surprised her with a printer and photo paper and ink so she could print her photos. Nicolle was thrilled with all her new gifts. Ivan wished for a touch screen television since he is legally blind. So he wished for a smart TV which will follow voice commands. So we found a Samsung 46” LED TV with everything to make it possible for Ivan to enjoy. We surprised Ivan and his family at the BJ’s Restaurant by Loma Linda. Thank you to BJ's Restaurant in San Bernardino. 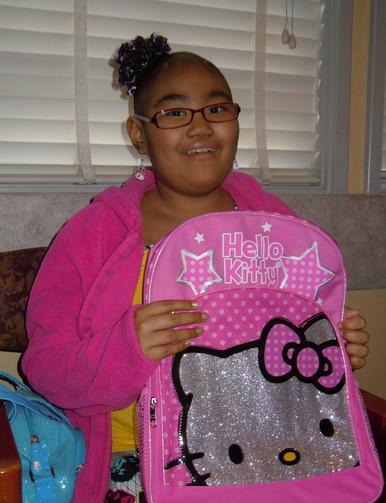 Amber had a large wish list of Hello Kitty items. We granted her wish for Xbox Kinect and games along with a pink Razor, a Bike and a matching Helmet. We surprised her with a Hello Kitty Boom Box, iPod Touch, Laptop, Xbox 360 Kinect Bundle, 2 games, 2 DVD’s, Hello Kitty Suitcase, backpack and alarm clock. We also surprised her with lot of pink clothes and Hello Kitty Watch. We surprised Amber and her family at her favorite restaurant Olive Garden. Thank you to The Olive Garden Restaurant at Main Place Mall in Santa Ana. Casey wished for a iPhone, Laptop, Tilly’s Gift Card and Kinect for Xbox. We granted his wish with the help of his mom who took care of the phone contract and we purchased the phone and case. We also surprised him with a laptop with loaded with MS Office and a backpack. We also surprised him with Kinect sports and Wipeout and Kinect system. We surprised him with clothes from Tilly’s and comfortable clothes from Kohl's. We surprised him with a jersey from his favorite team The Detroit Redwing Datsyuk jersey as he loves hockey and red is his favorite color. Thank you to BJ’s Restaurant on Jamboree in Irvine. Tyler wished for a laptop so he could watch movies and an iPad to play games online. We granted his wish with a laptop, iPad and Apple TV and all the accessories. We also surprised him with clothes from Tilly’s and Active along with comfortable clothes from Kohl's. We granted Tyler’s wish at his favorite restaurant Benihana’s in Anaheim with his family. Tyler loved everything. Thank you to BestBuy on Tustin Ave in Orange for Tyler's laptop. Eddy wished for a camera because he took a photo class and loved it. We granted his wish with a Nikon D5100 digital SLR camera, 16gb SD card, camera bag, filters, lens 55-300 mm and a tripod. We also surprised him with a photo printer, ink and paper. Lastly we surprised him with lots of clothes which he really liked. We surprised Eddy after his clinic appointment at Rady. The social worker and nurses shared that it was the most talkative they have ever seen him and he was so happy. They hadn’t see him like that before. Tate wished to stay at The London in A and eat at Gordon Ramseys Restaurant. We had it all planned and arranged but Tate ended up back in the hospital and unable to travel. So once he was released from the hospital we rushed his wish to stay local. 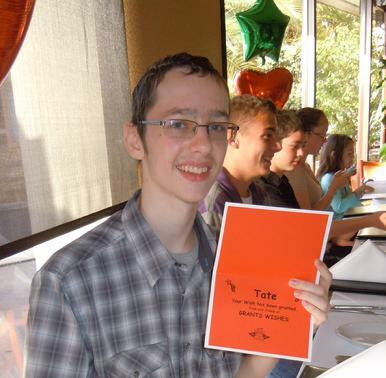 Tate then wished to go to dinner at Ruth Chris in San Diego by the water. We surprised him with a limousine ride by MasterPiece Transportation to and from the restaurant for Tate and his family and friends too. They enjoyed a great dinner and Ruth's Chris Steak Housedonated the appetizers, desserts and beverages. The Chef also made a special visit to the table to meet Tate. They all enjoyed a wonderful dinner and Ruth's Chris Steak House was very accommodating sitting Tate and his family in their own area which worked out great given Tate is hooked up to a lung machine to help him breathe. We also surprised Tate with goodie bags in orange and green his favorite colors+6 for everyone for the Limo ride home. The last surprise for Tate was another gift certificate for Ruth's Chris Steak House for him to return with his family and friends within the next week. Tate had a wonderful dinner and ate 2 desserts of crème Brule. Tim wished for laptop with Rosetta Stone in French, ipod, PS3 games, Bunk bed, Dr. Who Comforter and TV. We granted his wish with a bunk bed from Ikea with 2 mattresses, duvet cover from the Children’s Room in the UK of Dr. Who along with 2 throw blankets and Dr. Who 3D poster. We also surprised him with 2 mattress pads, sheets, pillows and comforter sets for the bunks. We also surprise him with a laptop and Rosetta Stone in French along with Ipod Touch, PlayStation 3, TV, DVD’s, PS3 games and extra controller. Tim was competely surprised and happy for his wish. Michael wished for an ipad3, Nintendo DSi and Blue Bed. We granted his wish with all the accessories including a case and stylist. We also surprised him with the Blue Bed that he wished for from Ikea along with mattress and all the bedding including gift card for a mattress pad, pillows, blanket, sheets and Toy Story comforter set. We also surprised him with a new laptop, TV and DVD Player. The last surprise was a new Nintendo 3DS and games. Michael was happy and excited. Tony wished for an iPad, toys, clothes, movies. We granted his wish in the hospital so he would have lots of toys, blankets, DVD’s and Ipad, Wii Games to play and personalized M&M’s to bribe his nurses . Tony was very exited and opened every gift with lots of enthusiasm and strength. We also surprised him with Marvel comic bedding and blankets along with a toddler bed bedding set in Disney Cars. Tony loves Transformers, Power Rangers and Marvel so we found lots of cool toys and cars to surprise him. He was the fast and energetic in opening all his wish gifts, 2 wii games along with Skylander and Skylander characters from each world. We also surprised him with lots of clothes, PJ’s and 2 sets of shoes. Wished for an Ipad 3, Ipod, team jerseys, remote control helicopter. We granted his wish only one week after the new release of the Ipad 3 with cover, 250 in Itunes, Printer which is compatable with the IPad and Itouch. We surprised him with 4 different jerseys and sweats from his favorite soccer clubs. We surprised him at his favorite restaurant La Bella for lunch with his family. La Bellas gave Isaac a play card to play their games too. Isaac had a great time with his family and loved his wish gifts. Kevin wished for an Ipad. 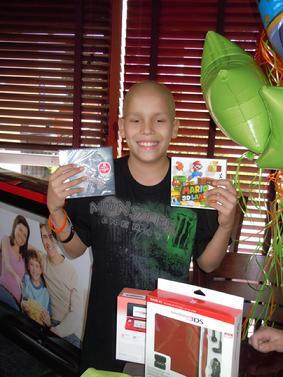 We granted his wish along with a laptop, speaker system, Printer, Xbox gaming system, Xbox games and DVD’s. We surprised Kevin at the BJ’s Restaurant in Moreno Valley who hosted his wish party for him, his parents, sister and brother. They enjoyed a great lunch and dessert and Kevin loved his wish gifts all wrapped in his favorite color of green. Thank you BJ's Restaurant in Moreno Valley. Trevor's wish list was long, we granted his wish with a flat screen TV, BluRay Player, Two season passes to Disneyland, ipad 2, ipod Touch Legos and remote control helicopter and Ferrari. We surprised him at BJ’s restaurant in Tustin with all his gifts. He has asked his mom if they could have lunch at BJ’s and so it was the perfect surprise. He enjoyed his lunch and white chocolate piezookie. We granted his wish while he was in the hospital. It was a big surprise as we woke him up. "It was the best wake up call". We surprised him with a MacBook Laptop and cover along with a new Ipod Touch and the camera as he loves to take photos of his family and friends and great views. He loved all his wish goods including a red photo album for him to fill with new photos after he prints them on his new photo printer. Abigail wished for clothes and toys. We surprised Abigail in the hospital with lots of gifts wrapped in Dora and Spongebob bags and purple. The first surprise was Spongebob blanket and pillow, the second surprise was a Dora Blanket and pillow for her to use during transplant. We also surprised her with a laptop and DVD’s so she could watch movies and use webcam to keep in touch with family members while she is in the hospital. We surprised her with clothes, accessories, shoes and Nintendo DS System and Games. 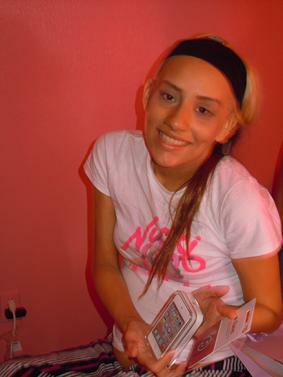 She was a happy young lady. Jessica wished to go to California Adventure and Disneyland. She was surprised with a night stay at The Disneyland hotel and 2 day hopper tickets so she can go between parks anytime she wishes. Disney Gift Cards to cover all their expenses for the 2 days for food in the park. We began Jessica’s wish at Denny’s on Katella with her friends and family for breakfast. Denny’s provided breakfast for the entire group. We also surprised her with clothes in her favorite color of pink from Justice. She loved them all. Then we surprised her with a Wii System, Extra controllers and games. We followed them into Disneyland to take a couple of photos and surprised her with a gift certificate for Build a Bear. We surprised her with Disney Souvenirs and wrapped in Minney and Tinkerbelle bags with lots of balloons. 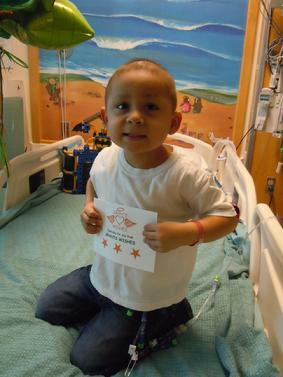 Mason wished to go to California Adventure and Disneyland. So he was surprised with a 2 night stay at The Grand Californian Resort and 3 days hopper tickets so he can go between parks anytime he wishes. We also gave them Disney Gift Cards to cover all their expenses for the 3 days for food in the park. We greeted them at the Grand Californian Hotel for the initial surprise and then followed them into Disneyland to take a couple of photos. We surprised him with Disney Souvenirs and wrapped in Cars and Disney bags with lots of balloons.